I come from the school that any good tasting filling is versatile in different applications, whether it be stuffed into baked dough, layered or stuffed with pasta or even used as a pizza topping. The chicken pesto filling I came up with is an example of a versatile recipe that would be great in a calzone, stromboli, lasagna, manicotti or topped on a pizza crust. For this recipe, I used the filling to stuff jumbo shells but feel free to use it however you'd like. This dish came about after realizing I had quite a few leftovers of pesto, cooked and shredded chicken, various cheesse and jumbo pasta shells. I combined the pesto, chicken and cheese, tasting as I went along until the filling was just right. Feel free to adjust the measurements to your tastes. Since I prepared this as a freezer meal, I was hopeful it would come out well and it certainly did. When I make this again, I plan on including additional ingredients such as diced red bell pepper, sun dried tomatoes or even top the dish with a crunchy topping of buttery panko breadcrumbs before baking. 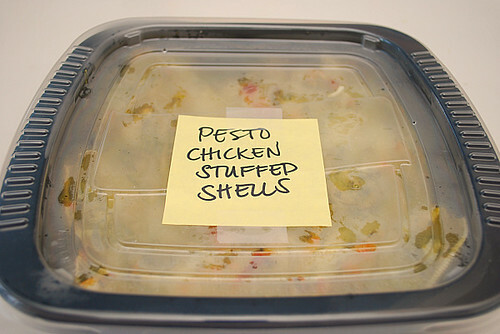 * To make ahead/freezer meals - Prepare as directed but place filled shells in an oven- and freezer-proof baking dish. Top with remaining 1/4 cup of cheese over filled shells, cover and freeze. When ready to prepare, defrost. Preheat oven to 350 degrees and bake shells uncovered for 35-40 minutes or until shells are bubbling hot and cheese melts. I'm loving all of these freezer recipes! This pasta dish looks fantastic. I could so sink my teeth into these! Love everything about them - the pesto, pasta, chicken...Home Run, Joelen! 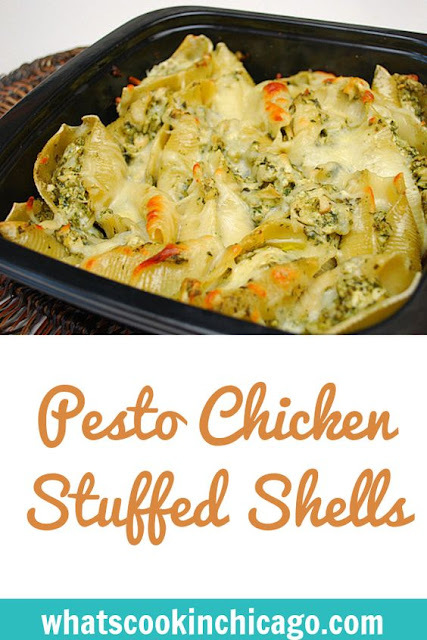 Love pesto, pasta and chicken so I'm thinking I'm going to try these. Thanks for the recipe. I'm definitely going to be making these stuffed shells - what a creative and tasty twist on a classic! Stuffed shells are my go-to meal for using up left-overs too. I usually make some type of Ricotta mixture but pesto sounds yummy too! this sounds so delicious! I'm definitely going to have try to this one! I made these today and they were very dry. It's almost like it was missing something. It also did not make nearly as many as you said it would. I thought that these stuffed shells sounded AMAZING! I had already bought everything to make them and then read the comment that said they were dry and didn't make as many. This made me a little worried, so I made a creamy pesto sauce to cover them with before I cooked them, as well as added about another ounce or two of cream cheese to the filling. With those few changes, they were great and didn't dry out at all! My family LOVED these! Thanks for sharing a great recipe! I just made these tonight for me and my boyfriend. I halved the recipe and it made just enough to stuff them all and they were beyond delicious! I did accidentally add an entire cup of Parmesan cheese but no one here was complaining - haha! Thank you for sharing this fabulous recipe! I followed this recipe exactly and it was AMAZING! I don't know how you could possibly think it was dry. Perhaps you started with dry chicken? It also made the intended amount. I stuffed 14 shells pretty full. I will be making this again and again. Thanks for the recipe! Found the picture & link to this recipe on Pinterest! Can't wait to try! Also featured on my blog! Tried the Chicken Pesto Stuffed Shells tonight for dinner and they were just delicious! Simple to make and a hit with my family. Thank you for such a great recipe, will for sure make again. I made these tonight and they were AWESOME. I added 1 oz cream cheese and 4 oz of Philadelphia Cooking Crean (Italian Cheese). I made 20 shells and had just enough to fill each one up nicely. So much better (IMO) than ricotta based stuffed shells. Definitely goes in my rotation! Question regarding the prepare ahead and freeze part - when you say "prepare as above" do you mean up until the baking part? Or do you bake them, then freeze them and then reheat? I'm never sure with pasta dishes (like this or lasagne)if you are supposed to pre-bake before freezing. Hi Andrea - * To make ahead/freezer meals, cook pasta shells only until al dente. The pasta will finish cooking when the dish is baked. Drain the pasta shells and fill with the filling as reflected in the recipe. 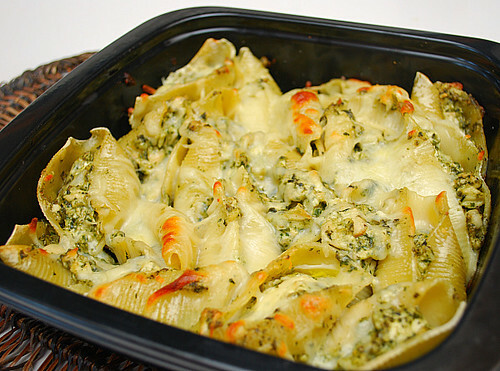 Place filled shells in an oven- and freezer-proof baking dish. Top with remaining 1/4 cup of cheese over filled shells, cover and freeze. When you are ready to prepare and eat the dish, remove from the freezer and defrost. Preheat oven to 350 degrees and bake shells uncovered for 35-40 minutes or until shells are bubbling hot and cheese melts. It's as I mentioned above but slightly clarified. Hope this helps! Thank you Joelen. I made these tonight and they were fabulous. Served a batch for dinner and one is in the freezer. I've never done stuffed shells before. I had them once when I was a kid and was repulsed by them so I've always avoided them. I think it was all the wads of ricotta. Thank you again for replying so quickly to my question. omg I just ate these. Absolutely awesome. I love them! I made them according to the recipe along with the breadcrumb topping. Next time I'm going to top them with sauce to keep the shells soft. I will also double the recipe and freeze half. Thank you! I doubled the filling and this worked great! I didn't count how many shells I put in the water, but there was enough filling for almost a whole box of shells. I used 1 cup of parmesan and a 1 cup of asiago for the filling...yummy! I used 1 oz extra cream cheese and 1 TB more of pesto...they were amazing but rich. (Made 20 shells) Next time I think I will cut out the garlic...the pesto I bought was a Basil Pesto and I think it had enough garlic in it! Very good and will make again! I made these for dinner a few nights ago and they are delicious! !We loved them!! They were very moist and flavorful!! Some friends and I made this as a freezer meal. One of my friends just baked hers and she said the oils separated pretty badly. I did not see it so I am not sure exactly what it looked like. How would you suggest preventing this? Would adding extra cheese before baking help to absorb the oils? Hi Kelsey! Thank you for trying this recipe with your friends. When I made this the oil from the homemade pesto I used did separate a bit however we didn't mind it too much because we had garlic bread that was delicious sopping up the flavored oil. If you want to prevent this, I would suggest 1)reduce the amount of oil used in a homemade pesto just for this recipe or 2) reduce the amount of pesto to 2 tablespoons and add 1 tablespoon of freshly chopped basil to the filling mixture. I hope this helps! These shells were the bomb! Very rich and full of flavor. Can't wait to try more of your tasty looking recipes. Making these shells for a second time tonight! There are no words for how delicious they are. My roommate and I kept looking at each other saying these could have been straight out of a restaurant. Thanks for such an amazing recipe! Do you bake the chicken or pan cook it? Hi Anonymous - the recipe calls for shredded cooked chicken... so you can either bake, boil, or pan cook the chicken however you'd like. A great shortcut is using a store bought rotisserie chicken. Hope this helps! This was amazing!!! HUGE hit with the whole family!!! Thank you!! Can't wait to try this! Can you recommend a brand of pesto to buy? made these tonight and froze a batch. my husband and i LOVED them! Wayyy better than ricotta stuffed shells. I also added some cooked spinach in the mixture...yum! Does it need to be fresh cheese? I only have the parmesean in a can but I also was able to buy a bag of finely grated that is probably more fresh than the can. I live outside if the USA so it's not easy to find everything at my grocery stores. I wonder if this would also be good with mozzarella cheese? I also wonder if it would be good with some marinara sauce but where would I add it in? I added marinara to mine and they were great! I just poured the sauce on the bottom of the pan and added the shells on top. YUM! I made 3 of these tonight, one for a sick friend, one for tomorrow nights dinner, and one for the freezer. I sampled the chicken filling and I am pretty sure these will be a regular in our house! I made these last night and they were a hit!! Wonderful flavor in the stuffing! I'll definitely be making these again and again! Thank you for the recipe! I made these for my family tonight. I steamed some spinach, chopped it up and added it to the mixture (also I cooked the chicken in the crockpot yesterday). My 3 year old, 1 year old, my husband and myself loved this recipe!! Thanks!! I finally made these! Wonderful!!!! I plan to make them again, double the recipe and freeze half! I read all the comments above and do have a question similar to a few of the other readers. My shells were a little "crisp" on the top parts. Any suggestions? Also- I used pesto in a jar. How else do you buy it? And do you have a recipe to make your own? This is my first recipe with pesto- I am now looking forward to more! Love it! Thanks so much! Will make these again, but will cover for most of the cooking time, as the shells dried out alot...perhaps using a smaller baking dish so the shells are squished together would work too. I might add a little chopped artichoke next time too, but will definitely make this again! These were great and simple! I made these tonight, but my shells ended up hard after the oven, what did I do wrong? After freezing, I wanted to finish these in the microwave rather than the oven, so first I thawed them in the fridge. Then I put a thin layer of spaghetti sauce in a dish, added the shells, and drizzled a little more sauce over the tops. Cover, microwave, and wow! Moist pasta shells, great filling! Served with a spinach salad and bread. Thanks so much for the recipe! I made these shells for a vegetarian friend of mine, so I used 2 baskets of mushrooms sauteed in butter instead of the chicken. I also poured a jar of store-bought marinara sauce over the shells before adding the cheese on top. I doubled the cream cheese, pesto, and garlic too. They were sooooooo good! I actually made some chicken and some mushroom at the same time, and I liked the mushroom ones better! And I'm a carnivore! I found these via pinterest and they are baking in the oven right now, my house smells amazing and I can't wait to eat them. Thank you so much for sharing! I love stuffed shells, and this is one of the best variations I've tried. I freeze the stuffed pasta plain (first freeze on a baking sheet, then bag). To reheat, thaw them slightly in the microwave, then place the shells on a thin layer of spaghetti sauce in a baking dish. Put some sauce over the top as well, then add the cheese. Cover, and microwave until heated through. A great dinner and a cool kitchen! Thanks for sharing this! Thanks for sharing this recipe, I can't wait to try it. I just wondered what kind/brand of pesto you recommend using? Also, was there a reason you don't use ricotta cheese, could you use it or would it not be as flavorful? I love ricotta cheese, but I like cream cheese too so I was just curious... Thanks again! Thanks so much for the awesome recipe!! I fed 5 people, they LOVED IT!!! I did happen to add a bit more pesto, but that's because I friggen LOVE pesto! :) This was so great! I was surprised at how full I got! I only had 3 shells and was completely full. Thanks again! So yummy! I must not have stuffed my shells with as much filling though because mine made 29 shells! My husband and I were surprised that they didn't require any extra sauce, but they were still delish! The shells were a bit crispy so I may bake for less time or cover it next time. Thanks for the great recipe! These were just AMAZING. I keep telling all my friends it's like "restaurant food." My shells got crispy on the bottom so it made cutting them very difficult. Was thinking I might put a tiny bit of broth or water on the bottom of the pan to see if that helps. Thanks so much for such a delicious recipe! WOW! These look awesome! I'm planning to make these this week - I have everything I need so can't wait to try it out!! I made these last night for my family. I doubled the recipe because we are a large family. The filling was DELICIOUS, but next time, I will either bake them covered in the oven or I will add sauce. The shells were much too crisp for our liking. I tried this recipe yesterday and was really yummy :) chicken and pesto is a great combination, first time I eat in Italy a recipe like this. It can be also a good choice for a healthy dinner. a normal portion can cahe around 500-600 calories. I made these tonight for dinner and they were a huge hit! I tripled the recipe because I wasn't sure how much one batch was intended to feed, and it fed 7 comfortably with lots of leftovers! I modified the recipe a bit and added a can of roasted tomatoes, which was a great addition. Agree with a lot of the comments, the shells do dry out a bit but I drizzled olive oil over them before I cooked them and that seemed to help a bit. Overall a great dish!! This looks delicious! I'm pinning it and hopefully will be making it soon. =) Thanks for the recipe! Made this today and served 1/2 at home and the rest at our church fellowship tonight. Everyone loved it! I too doubled the filling ingredients. I added chopped up artichoke hearts too! I baked the chicken in olive oil during am service this morning and drizzled the juices over the filled shells. They were wonderful. Cooking the shells just to al dente is important. Otherwise they fall apart. I'm going to try thus tonight! Sounds amazing. I made this twice now.The first time as written.The second time using sweet italian chicken sausage and covering with alfredo sauce.YUM! It's now my "go to" quick dinner. I made this for dinner tonight and it is delish!! As mentoned above, it can be a bit dry. Next time I'm covering the alfredo sauce or marinara sauce. I'll be making these again!! This is yummy! I am sharing my experience with this as leftovers on my blog (Go Cheap or Go home) this week, and I will be directing my readers to you for the original recipe so everyone can enjoy. Thanks! Exercises, Diets and Healthy Recipes are the quickest way of Losing weight naturally, we provide total solution of lose weight fast by using Healthy diets and Aerobic workout which is the best way for losing weight in one week. thanks for the great chicken.Try it , taste it - loved it ! very dry! needed extra sauce! It looks very delicious and healthy. I think it is healthy food option for people who are undergoing weight loss program. I will definitely try this. Thanks for sharing such great recipe. I'm in the process of making these now. The recipe filling sounds perfect, but in my experience baking things like these, baking them covered and with even a little bit of sauce (like a marinara for this one) seems like it would solve the dryness problem. I can not wait to try these [again]!!!! I made this last night and it rocked!!!!! I made this and it was delicious. I blogged about it as well in case you'd like to check it out. I made these twice now, and they are SOOOO good! They are actually my favorite dinner now. BUT, the shells turn out crispy on the ends, and my husband doesn't care for that. How can I keep the shells from getting crispy? @Katrina, you can try covering the shells with more sauce and/or cheese so they are not exposed as much when it bakes. Hope that helps! I just absolutely love this recipe! I make it all the time! thank you again! Just had these for lunch. So good! I liked this. Was a bit salty but may have been due to the store bought pesto I had. Overall it was yummy.